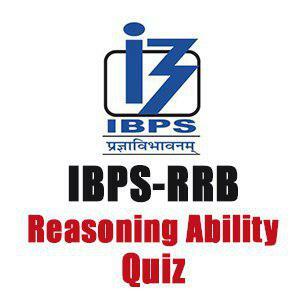 Mahendra Guru August 25, 2018 Important Reasoning Questions For IBPS RRB PO/Clerk, Reasoning Ability For IBPS RRB Clerk/PO, reasoning questions. ‘for going help with’ is written as / को लिखा जाता है ‘yo di na ma’. Q.1 Which of these can be coded as, ‘ha di na yo’? ‘ha di na yo’ किसका कोड हो सकता है? Q.2 Which of the following is the code for ‘look for’? ‘look for’ को कैसे कोड किया जाता है? Q.3 How will, ‘had to help’ be written in this code? ‘had to help’ को कैसे कोड किया जाता है? Q.4 Which of the following may represent ‘had’? ‘had’ को कैसे कोड किया जाता है? Q.5 What does ‘ma’ represent in the code? ‘ma’ किसका कोड है? Q.6 Which of the following number is written ##@#@ in the form of that code? निम्नलिखित में से कूट ##@#@ के रूप में कौन सी संख्या लिखी जाती है? Q.7 If #@# multiply by @##@ , then what will be product? यदि #@# को @##@ से गुणा किया जाए तो गुणनफल क्या होगा? ‘for money only joy’ is written as / को लिखा जाता है ‘oj ft ds un’. Q.8 What is the code for ‘money’? ‘money’ का कोड क्या होगा? Q.9 Which of the following may represent ‘money is important today’? ‘money is important today’ का कोड क्या है? Q.10 Which of the following may represent 'now there is work’? 'now there is work" का कोड क्या है?